My favorite part of making slice-and-bake sugar cookies is slicing the dough. When loaded with things like dried cranberries, orange zest, and poppy seeds, each slice reveals a different mosaic of deliciousness. It's mesmerizing. I could slice for days, mostly because I'm a crazy person. Get cookie slicing. You might be a crazy person, too. This is my favorite slice-and-bake cookie from Dorie Greenspan and Deb from Smitten Kitchen. In the bowl of an electric stand mixer fitted with a paddle attachment, beat together the butter and sugar on medium speed until soft and creamy, about 2 minutes. Add the egg, yolk, and vanilla, and beat until well blended, another 2 minutes. Stop the mixer and scrape down the bowl as necessary. Add the flour mixture, orange zest, cranberries, and poppy seeds, all at once, to the egg mixture and beat on low speed until just incorporated. Stop the mixer and remove the bowl and finish incorporating the ingredients with a spatula. Divide the dough in half and place each half on a sheet of waxed paper. Press each half into a log 1 inch in diameter. Roll into plastic wrap and store in the fridge to chill at least 3 hours, although overnight is best. When ready to bake, place racks in the middle and upper third of the oven and preheat to 350 degrees. Line 2 baking sheets with parchment paper and set aside. Remove the dough from the refrigerator, unwrap, and use a knife to slice dough into ⅓-inch-thick-rounds. Place on baking sheet about 1 inch apart. Bake for 12 to 15 minutes, or until barely browned on the edges. Remove from the oven and cool on the baking sheet for 10 minutes before removing to a wire rack to cool completely. These cookies will last, well wrapped, at room temperature for up to 4 days. 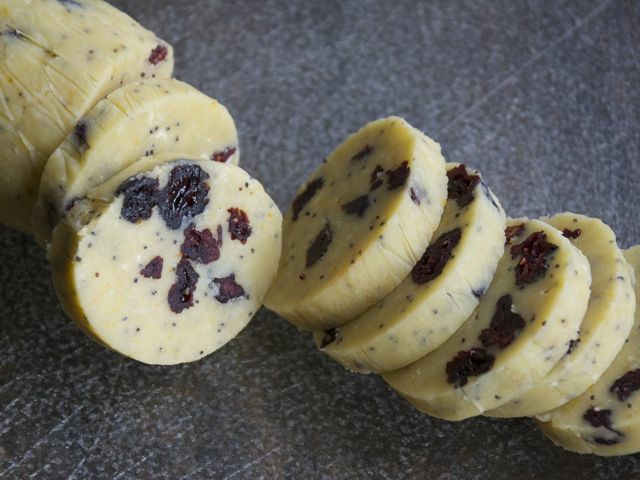 Culinate editor's note: If you don't want to wait three hours (or overnight) to bake the cookies, put the wrapped dough logs into the freezer for 30 minutes, then slice and bake.